Going back to natural can be a delightful experience, but anyone who has tried knows that it isn’t easy. The hardest part is transitioning, or allowing the natural hair to grow out. You have to battle with two different hair textures which can make your daily style routine twice as long. To make the movement smoother from relaxed to natural, some women choose to hot press their new growth to match straighter ends. The question is—is it the best way to transition? There’s a point where the curly hair, or your new growth, meets the relaxed hair. That point is considered a line of demarcation and this area of the hair is extremely weak and prone to breakage. When transitioning, it’s important to regularly deep condition and use protein treatments to strengthen the natural hair and to minimize hair damage. 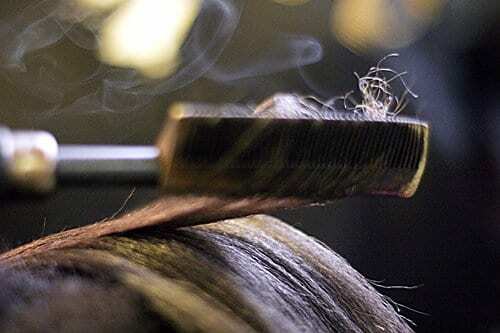 Pressing new growth applies heat to the air, which further breaks down the strength in the hair—so pressing simply makes the hair weaker, or thinner, in that regard. Secondly, pressing with a hot comb involves a lot of heat and if we haven’t learned by now, we should know that heat can damage the hair. Too much heat applied to new growth can alter the texture of your natural hair, making it “damaged straight” instead of its natural curly. The only way to get rid of it will be to restart your transitioning process or to just go for the big chop. Which gets to the last point. Cutting is inevitable. The whole goal of transitioning is learning how to take care of natural hair, preparing yourself for a new form of styling. The hot comb and flat iron on hair with two textures still shows that you have yet to allow yourself to embrace the natural hair journey you are embarking on. Instead of trying to press the new growth to make it straight, you should try styles that curl your relaxed hair to make them curly. This will allow you to become more knowledgeable in your styling and more comfortable with yourself within. If natural hair is your goal, then ditch the hot comb for transitioning. You’ll barely need it later on down the road.